We’re taking a road trip to the big house this week. 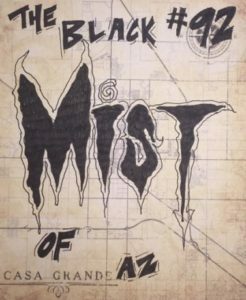 Casa Grande Arizona is filled with mysterious tales of the unknown and frightening but we’ve found an oddity that is sure to leave you thinking twice about going into the desert after dark. A silent black mist slowly creeps through the canyons stalling cars and baffling hikers as it slowly engulfs them. Is it an ancient native American spirit in search of the souls of lonely travelers or just one of the dust storms so common in the area? We’ll hash out the lore and delve into the local legends. All work and no play makes Harley a hangry dude, so we’ll grab a bite to eat at the Big House Cafe. All you can eat tacos, people! This is what we’ve been training for. It’s go time, Oddballs! While you’re in town, take a side trip to the Casa Grande Ruins National Monument. Mysteriously abandoned by the Sonoran “Hohokam” people in the 1400’s, we’ll explore the majestic landscape and remains of the village they left behind. So, was it famine and disease that caused them to abandon this once thriving village, or perhaps something more sinister. Maybe it was all the freakin rattlesnakes in the state of Arizona! Speaking of snakes, Brett’s Top 5 is bound to get you a little…..’rattled’……Get it…rattled?……No?